A personal celebration, inquisition, investigation, and critique of the myth of the "rational person". Not a whole lot of new ground covered though. Well written, breezy style, easy-to-read, with lots of experiments the author conducted described in detail. By itself the book is good. Recommended for sure. But if you have read other books in this area, behavioral economics, like Stumbling on Happiness (my review) or Nudge: Improving Decisions About Health, Wealth, and Happiness (my review), then at least some of the material will read familiar. Especially the parts about expectations and adaptation, which is covered at length and in a lot more depth in Stumbling on Happiness (my review). The organization of the book is also a bit different. It is divided very clearly into two parts, and is also more personal than other such books. The underlying premise of the book is that while we, humans, should be rational, and make decisions that are in our best interests, we often do not. "From a rational perspective, we should only make decisions that are in our best interests." But we don't. Surprise! 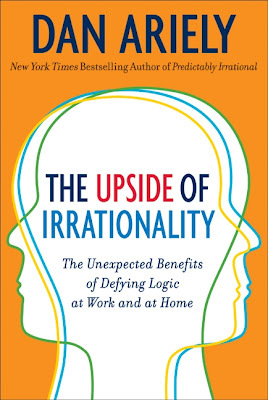 The title is a bit misleading, but given the incredible success of Dan Ariely's first book, Predictably Irrational, it would have been irrational for him not to reuse part of the title for his second book! The very first irrationality described, so to say, is the fact that more pay does not necessarily translate into better performance, or even better motivation. Thankfully, the financial crisis of 2008 proved that more money does not translate into better results. Quite the opposite in many cases. Another finding that is contrary to rational thinking is one of "contrafreeloading" - contrary to expectations, people do not want to always maximize their reward whilst expending a minimum amount of work. Borne out in several experiments, people do value the rewards if they perceive they have expended at least some effort into it. As a corollary, "... sucking the meaning out of work is surprisingly easy. If you're a manager who really wants to demotivate your employees, destroy their work in front of their eyes. Or, if you want to be a little subtler about it, just ignore them and their efforts." [page 76 of the Advance Reviewer's Copy]. Ouch!!! How many times, at how many places have we seen it, experienced it, and possibly even inflicted this form of motivational destruction onto others? It stands to reason therefore, that beauty lies not in the eyes of the beholder as much as it lies in the eyes of its creator. "The Ikea Effect" chapter covers this irrationality. The effort that we put into something does not just change the object. It changes us and the way we evaluate that object. Greater labor leads to greater love. Our overvaluation of things we make runs so deep that we assume that others share our biased perspective. When we cannot complete something into which we have put greater effort, we don't feel so attached to it. Or what about revenge? Surely there is nothing so irrational, and emotionally destructive as revenge, is there? Well, it turns out, Ariely posits "that the threat of revenge - even at great personal expense - can serve as an effective reinforcement mechanism that supports social cooperation and order. ... I do suspect that, overall, the threat of vengeance can have a certain efficacy." Don't believe me? Or the author? What about PET? Positron Emission Tomography. And so on... This book is not likely to become a classic or an instant hit, but offers enough nuggets of insight that you may want to bookmark several pages and return to them every now and then to remind yourself that man is, after all, not a rational animal. Page numbers, where mentioned, are from the uncorrected proof provided by Amazon Vine.